Ascanius: The Youth Classics Institute is a nonprofit organization dedicated to advancing the knowledge of and inspiring lifelong learning about Latin, Greek, and the ancient Greco-Roman world, especially at the elementary and middle school levels. Since 2000, we have served thousands of students and teachers on the east coast, west coast, and many places in between. Through our programs, we encourage today's youth to learn about ancient societies and compare them to their daily life in the modern world. We are dedicated to bringing life to Latin and the ancient world by working directly with elementary school students. Through a single-day Roman Explorers program, students experience the excitement of the Classics through activities in Latin, Greek, Roman Culture, or Mythology. 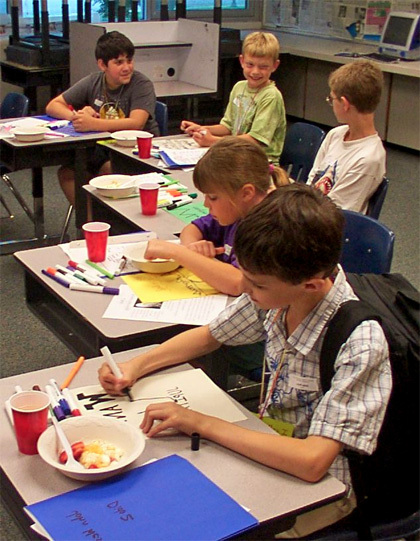 The energy-packed curriculum always engages students with fun games, crafts, and hands-on activities. For the students who are already learning Latin, we hold competitions like SCRIBO, which invites students from across the world to write stories in Latin and share them with their peers. We also regularly offer Classical Promise Scholarships to middle, high school, and college Latin students who wish to share their passion with younger students in their own community. Our publications, such as the Activitates Liberis series and Vocabula Picta, provide teachers and families with the ideas, materials, and information they need to breathe life into the Classics in their own home or classroom. In addition, we offer a membership program which gives teachers and parents extra resources, including a members' exclusive webpage of materials and a bi-monthly e-newsletter with brand-new, ready-to-use lessons. Over 2000 years since Vergil wrote the story of Aeneas and his son Ascanius, Latin and classical civilization are still alive and well. Through our efforts, today's youth can experience the excitement of the culture that inspired our art, politics, literature, architecture, social values, and sense of history. We invite you to join our quest to share some of the world's most ancient cultures with the next generation! "We would wish for our children that their decisions be informed not by the wisdom of the moment, but by the wisdom of the ages; and that is what we give them when we give them knowledge of culture. The story of past lives and triumphs and failures, the great texts with their enduring themes - these do not necessarily provide 'the' answers, but they are a rich context out of which our children's answers can come."